The Ohio Bobcats (2-1, have gained enough momentum to leave their ugly 49-7 loss to the Louisville Cardinals in the dust with two straight one-score wins, . The team’s upcoming home game against the Austin Peay Governors (0-3) on Saturday at 2 p.m. is their last until Oct. 12, and can’t be taken lightly. Players can’t look too far ahead if they want to leave fans with a good taste in their mouths heading into MAC action. They’ve been trained in this short-memory practice season after season under head coach Frank Solich, and each week has been approached with a fresh start and an attempt to go “1-0.” However, tight end Troy Hill still finds motivation in a loss that took a lot of pride out of a team coming off of two bowl victories. Hill, who struggled to in the season’s first two contests, came up big on the first offensive drive against Marshall with three catches, including the initial score. If the Bobcat receivers and tight ends can streak across the field and force the Austin Peay secondary back, the offense will be able to get back to its balanced ways. This would open up the running game, so look for Tettleton and company to go deep early with some Solich-inspired trickery. Austin Peay’s opponent last week, Chattanooga, had three rushers compile 216 yards on the ground. With Ohio’s three-headed backfield monster – consisting of Beau Blankenship, Ryan Boykin and Daz’mond Patterson – yet to break through with a stellar performance, Austin Peay’s statistically bad defense presents a perfect opportunity for the running game to come alive. “We’re breaking up the carries a bit more than in past years,” Solich said of the rushing attack. 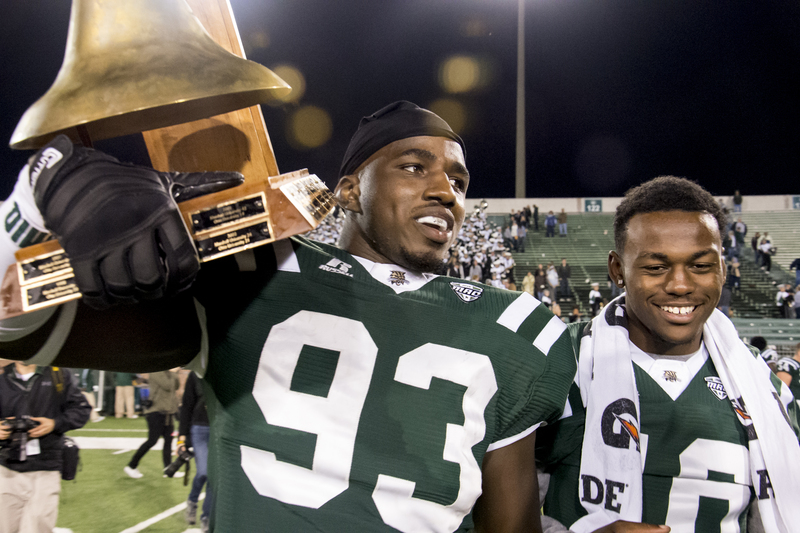 While Blankenship was a driving force for the Bobcats during the team’s 7-0 start last season, the defense has come a long way from being the inexperienced 2012 group to becoming the dominant, game-changing core in 2013. Two ‘Cats, linebacker Jovon Johnson and cornerback Devin Bass, have earned MAC East Defensive Player of the Week honors the past two weeks for their clutch turnovers in tight wins. 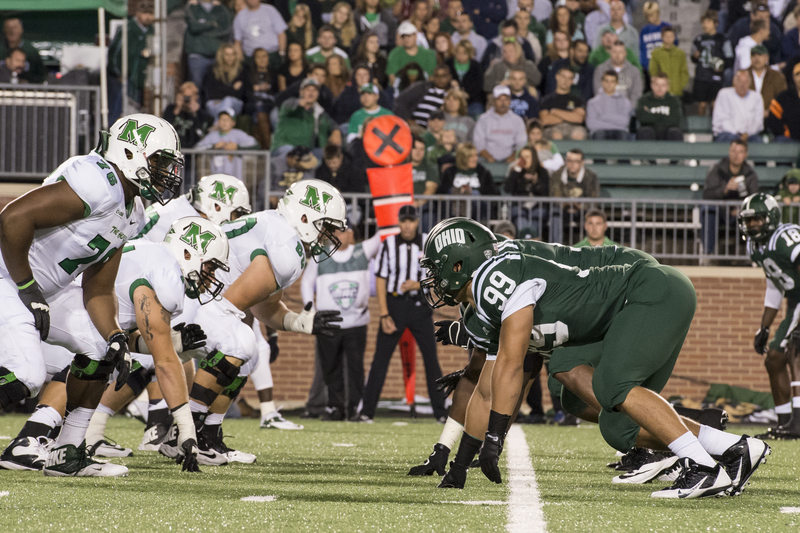 This trend may continue throughout the rest of the season, as depth has been on Ohio’s side through three games. “The number of injuries this year isn’t too far off from last year, just not as many season-ending injuries,” Solich said. Safety Xavier Hughes, who missed a lot of time in 2012 but has bounced back in 2013 with already three turnovers, has called this season’s secondary the best he has been a part of. From first to fourth stringers, multiple players with experience are seeing playing time. It’s evident that the competition for snaps is creating a healthy environment on the defense. “That’s what we are capable of doing, creating turnovers with the type of guys that we have on our defense,” Hughes proclaimed. With nine forced turnovers already this season, Ohio will look to add more to that total against an exposed Austin Peay offense in transition. Not looking too far ahead – If you look at the statistics, Austin Peay is not very good on paper. They’ve been outscored 125-13 through their first three losses and they have a porous defense that is missing its best player. This leaves Ohio with a chance to have a performance similar to their embarrassment of Norfolk State last season. While the Governors are in a transition process now with their offensive style, Ohio’s defenders have not let that slip into their minds. There’s an off week then MAC action awaiting the ‘Cats in week four, but this upcoming Saturday is game day, and that means “unfinished business” takes priority. Look for the team to jump all over the Governors early. Offensively: RB Beau Blankenship – Let’s take a quick look back on Beau’s first three games last season: 126.3 YPG and 4.3 YPC. Through the first three games in 2013, he’s only been able to average a far-cry 47 yards per game. I understand that he’s splitting carries with Ryan Boykin, but his yards per carry (3.4) should indicate that he’s also struggled. This is the game that he gets back on track, as the Governors’ front seven gave up over 250 yards on the ground last week and is a vulnerable group. Defensively: S Xavier Hughes – Until he proves otherwise, I’m going to have Xavier as the defense’s x-factor every week — at least until he stops causing turnovers. Through the first three games, Hughes has caused at least one turnover (two interceptions and one forced fumble). X forced a fumble on Marshall’s first drive to start the game, leading to a quick seven points for the Bobcats on the ensuing drive. Look for the determined and seasoned veteran to have a huge impact against a confused Austin Peay unit. Offensively: RB Tim Phillips – There haven’t been a whole lot of producers for the Governors, but Phillips is one who has managed to reach the end zone and compile (almost) 200 yards. He is averaging 5.2 yards per carry, so it’s a matter of Austin Peay getting their playmakers the ball. The Bobcats can virtually shut down the Governors’ offense if Phillips is taken out of the picture. Defensively: S Johnathan Shuler – The Austin Peay secondary hasn’t been one of the better core groups by any means; in fact, they were the worst secondary statistically last season. Shuler, however, is a standout player who led his team in solo tackles (43), interceptions (two) and pass breakups (five) last season and is currently leading his squad in total tackles (21). The Bobcat receivers may burn Shuler across the field on occasion, but he’ll be there to make the stop thanks to his burst of athleticism. Bobcats 42, Governors 3 – I should lose big points for betting against the Bobcats last game, especially being so critical of their defense. They’ve boasted two back-to-back MAC East Defensive Players of the Week in Jovon Johnson and Devin Bass. Look for the D to come up big again and even reach the end zone once or twice. This Austin Peay offense is still in its infant stage.